Like The Best Islamic Clothing? I just love hijab, abaya, jilbab, traditional Islamic dressing, and modest clothing and absolutely enjoy writing about them as well as sharing photos of them and helping others. 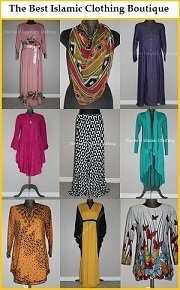 Here is the best selections of beautiful abayas for any occasions you can choose from my Abaya Store. Whether it is formal or casual event, this abaya make you feel appropriate and confident for the occasion. I personally prefer simple and yet fashionable black tone abaya as it makes me feel a little bit understated without compromising stylish and clean cut outlook. Some of the abaya in also style as a jilbab which is suitable for office wear as well. I love this type of abaya as it allows me to wear abaya to office and looking good and confident in it. However, it's handy to have an abaya with magnificent and intricate details in various colours in your wardrobe to suit special occasions. Just scroll down Abaya Store and take a look at this great abaya selections at great discount prices. Click on the headline links for more abaya information. Please click the link of the item for more descriptions, colors and designs. Here are my best picks from My Batua. These are my best picks from East Essence. I promise to use it only to send you The Best Islamic Clothing Newsletter.